Preliminary ProceduresDrain the cooling system. Refer toCooling System Draining and Filling.Remove radiator hose inlet. Refer toRadiator Inlet Hose Replacement.Remove radiator hose outlet. Refer toRadiator Outlet Hose Replacement.Remove the condenser. 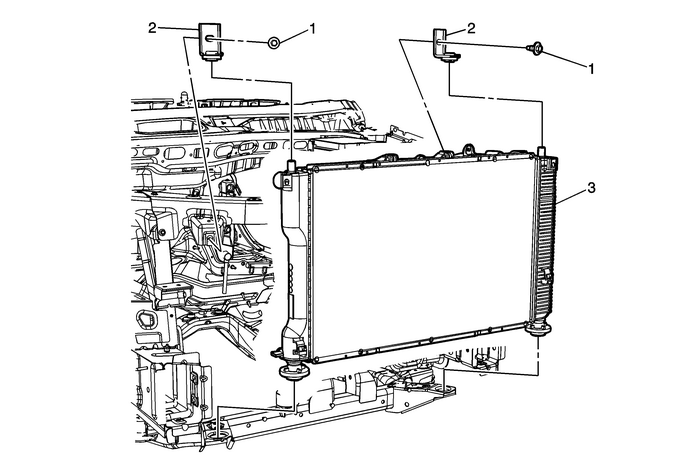 Refer toAir Conditioning Condenser Replacement.Remove the engine coolant fan shroud. Refer toEngine Coolant Fan Shroud Replacement.Disconnect transmission oil cooler lines fromradiator.